Where to bury dead pets or animals in Bengaluru? A fortnight ago, a kitten belonging to Aditi Surendra, a city-based graphic designer, passed away. Unsure of how to dispose of the body, Aditi sought help from her friends on how to dispose of the dead body. With no satisfying inputs forthcoming, she had to bury the kitten near the railway tracks, so that some other animal could feed on it. There is a BBMP animal crematorium in Magadi Road. When asked whether she knew about it, Aditi said she was not aware of the facility. “Plus, the kitten died early morning and we couldn’t drive until the next day. So keeping the body for two days would not have been hygienic,’ she said. Disposing of dead pets and animals is not just the concern of Aarathi alone, but many pet owners like her. In a city like Bengaluru where the number of pets is growing and several of them die everyday, systematic disposal of animal carcass has been an issue of concern for a long time. While those living in independent houses can afford to bury the body in their backyards, it is much more challenging for apartment dwellers. Often, the dead pets end up rotting in a dumpyard, canal or in landfills. Till recently, for those who wished to bid a decent adieu to their pets, the only way to do so was to bury their dead pets at the cemetery operated by non-profit organisation People for Animals (PFA). The six-acre burial ground in Kengeri that was opened in 2011 witnesses on an average 70 burials every month. However, this ‘decent’ burial comes with a cost. “There are two types of burial. The cost of regular burial is Rs 4,500 where the buried space will be used again after a year. The cost of special burial ranges from Rs 18,000 to 25,000 where a graveyard will be built and the land will not be reused for three years,” says Vindhya Madhav, who is in-charge of PFA’s pet cemetery. Animal welfare NGOs like Karuna Animal Welfare Association and KRUPA Animal Hospital and Shelter have developed their own burial ground to cremate the animals that die at the shelter home. “We have been burying the dead animals in a land donated to us by a farmer in Doddaballapur. There was news about BBMP constructing a crematorium. But we do not know if it has become a reality yet,” said a staff at Karuna. Poornima from KRUPA Animal Hospital and Shelter too told Citizen Matters that they have a burial ground meant for the animals that die in the shelter. BBMP’s animal crematorium opens, finally! With not many people being able to afford to bury their dead pets at PFA’s graveyard, there was a longstanding demand before the Bruhat Bengaluru Mahanagara Palike (BBMP) to start a crematorium exclusively meant for animals. In 2013, the BBMP started the work on constructing an animal crematorium at Sumanahalli on Magadi Road. The work on crematorium was completed by the end of 2014 and it was expected to be inaugurated in January, 2015. Unfortunately, the crematorium did not see light of the day for almost a year of its construction, which according to BBMP officials is due to “technical glitches.” Finally the good news for pet and livestock owners is that the crematorium has started operating in a full-fledged manner from November 9th, 2015. The animal crematorium built at a cost of Rs 3 crore is spread over three acres land adjacent to the human crematorium at Sumanahalli. “As on December 20th, 27 dogs and one horse have been cremated after it started operating last month,” said RR Nagar Joint Commissioner Dr Veerabhadrappa B. The animal crematorium has two incinerators. One for small animals like dog, cat, sheep and goat. Another incinerator is meant for cremating livestock animals such as cow, buffalo and horse. The animal body is burnt at a high temperature of 600 to 700 degree celsius. While burning the small animal takes around half an hour, cremating a big animal needs approximately 3-4 hours. “Understanding people’s emotional attachment towards their pets, we also have the facility to return packed ash of their pet after cremation. For this, people should wait till the cremation process is completed. We have made arrangements for a rest room in crematorium premises, for visitors to wait till the ash is packed,” the Joint Commissioner said. Here too the crematorium service is not provided free of cost. One has to pay a fee of Rs 300 for cremating a small animal and Rs 1,000 is fixed for cremating a big animal. The fee is applicable to only pet and domestic animals. If people or animal welfare organisations voluntarily bring the carcass of stray animals to the crematorium, the bodies are burnt free of cost. “The logic behind imposing the fee is that the people do not take this service for granted. There should be some value added to the service,” the JC says. Pet owners who wish to cremate their pet’s body, should also bring a wooden ramp to be placed inside the incinerator. Those who have not brought the ramp, can purchase it from a shop close to the crematorium (It costs Rs 150). There are four outsourced staff in the crematorium. With citizens not aware of crematorium facility even after two months of it becoming functional, the officials say that they will publicise about it in the coming days. “I have requested the Commissioner to upload information about the crematorium in BBMP website so that people can get to know about it,” Dr Veerabhadrappa said. As the crematorium is located at quite a distance from the main city, the question is, will citizens opt to travel that far to cremate the animals. “Considering the animal population in Bengaluru, we need an additional 2-3 crematoriums in different parts of the city,” says BBMP’s Animal Husbandry Department Joint Director Dr Maheshwara Gowda. This, he believes will make it convenient for people to transport the dead pets to the crematorium. When asked if the BBMP has a standard procedure or guidelines for disposing of the pet or domestic animal carcass, Dr Maheshwara Gowda said there was no such guideline. “We need to have one, but don’t have yet,” he said. Though Chapter 5 of BBMP’s Solid Waste Management manual mentions the need for disposing of dead animals, it does not elaborate the same. The manual does consider dead animals as municipal waste. It defines dead animals as those which die naturally or accidentally, thus differentiating it from slaughterhouse waste. “The reason for this differentiation is that large animals require special equipment for lifting and handling during their removal. If not collected promptly, dead animals are a threat to public health because they attract flies and other vermin as they putrefy. Their presence in public places is particularly offensive and emits foul smell from the aesthetic point of view,” the manual reads. Yet, the chapter which entirely speaks about methods of disposing slaughter house waste, does not explain how to dispose dead animals even in a line or two! 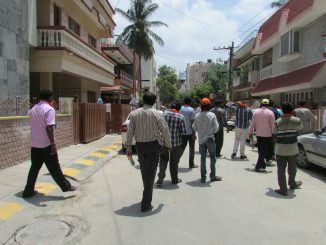 On the trail of the great Bengaluru election tamasha! It’s curtains down for BBMP election campaigning. With only one day left for the polls, candidates were busy with door-to-door campaign on Thursday. Our reporters find candidates impervious to all the brickbats they receive on the ground. Fees for cremation of Dog is Rs.300 as I paid the same today 8-11-2017. But the bamboo ramp (frame) is costing Rs.500 in the same premises.They are private outsourced by BBMP. But the BBMP Website says it is available for Rs.150. This needs clarification by BBMP. The general public are put to lot of mental tension as they come with grief due to separation of their pets. Yes. According to the BBMP officials, crematorium is open 24 hours. What are the timings? Is it open 24 hours?